Shop confidently knowing you are covered by our "No Worries" promises. Create, design, and print your labels. Find answers to some of our most frequently asked questions. Learn more about our products and services with articles and how to's. What's The Difference Between A4 and US Letter Paper Sheets? We offer our best estimates of shipment arrival dates based on our current inventory levels and carrier delivery times with standard shipping. We also offer expedited shipping options during our checkout process. You'll see exact shipping costs and arrival dates when you check out. Based on our current inventory levels and carrier delievery times, this is our best estimate when selecting Standard Shipping during checkout. We also offer expidited shipping options. Let us print your labels for you. Are you sure you want to return to the product page? The standard white matte label sheet is our most popular and versatile material. It is a bright white face sheet with a permanent adhesive. The material produces excellent results when printed with a standard laser or inkjet printer. Enter a quantity not listed below. Please select a material from the list. Please select a quantity from the list. Shop our wide selection of materials to find the right fit for your project, then choose the number of labels you need. Submit your artwork through our custom printed uploader. Acceptable file types include .ai, .eps, .png, .jpg, .jpeg, .gif, or .pdf. Review the final design and layout to ensure that your labels look great! Once we receive the final OK, allow 1-to-3 days for production. We can fulfill orders of any size on in-stock products - no quantity is too big or small. Place your order before 16:00 GMT and your in-stock items will dispatch the same business day. We offer everything you need to create the perfect label. Create the perfect label, for any occasion. Order as many (or few) label sheets as you need. The more you order, the more you save! Our custom printing experts will review your designs and work with you to create the best possible labels. As soon as your artwork has been uploaded and approved, your labels will ship in 1-3 business days. Whether you need 1 sheet, 100, or 1000s, there's never a minimum order! You never have to sacrifice quality for affordability with us. We offer the best labels at prices you'll love! Every order gives you access to Maestro Label Designer, so you can start creating your labels right away. You can also browse blank label templates available for each of our sizes or choose a pre-designed template from our always-growing collection. Our staff works to process and ship each order as quickly as possible. Once your order is on its way to you, you will receive tracking information to follow it all the way to your door. Maestro Label Designer is one of the easiest and most efficient ways to design and print your labels online. No downloads necessary and it is compatible with all OnlineLabels.com products. For use in any version of Microsoft Word. 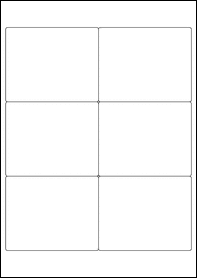 This is the traditional Portrait orientation template. Blank Label Templates for EU30139 Start your design from scratch. Download free blank label templates for Microsoft Word, PDF, or OpenOffice. "This company is the BEST EVER!!!!! I couldn't ask for better and very courteous service. I will never use another company."